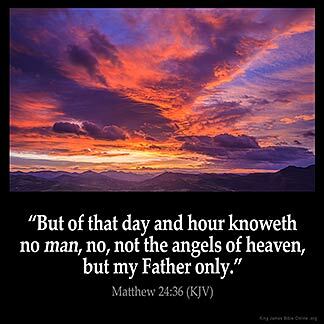 MATTHEW 24:36 KJV "But of that day and hour knoweth no [man], no, not the angels of heaven, but my Father only." 33So likewise ye, when ye shall see all these things, know that it is near, even at the doors. 34Verily I say unto you, This generation shall not pass, till all these things be fulfilled. 35Heaven and earth shall pass away, but my words shall not pass away. 36But of that day and hour knoweth no man, no, not the angels of heaven, but my Father only. 37But as the days of Noe were, so shall also the coming of the Son of man be. 38For as in the days that were before the flood they were eating and drinking, marrying and giving in marriage, until the day that Noe entered into the ark, 39And knew not until the flood came, and took them all away; so shall also the coming of the Son of man be. � But of that day and houre knoweth no man, no, not the Angels of heauen, but my Father onely. "But of that day and hour no one knows, not even the angels of heaven, nor the Son, but the Father alone. But of that day and hour no one has knowledge, not even the angels in heaven, or the Son, but the Father only. But of that day and hour no one knows, not even the angels of the heavens, but [my] Father alone. But as to that day and the exact time no one knows--not even the angels of heaven, nor the Son, but the Father alone. But of thilke dai and our no man wote, nethir aungels of heuenes, but the fadir aloone. 24:36 But of that day - The day of judgment; Knoweth no man - Not while our Lord was on earth. Yet it might be afterward revealed to St. John consistently with this. Mt 24:36 Of that day and hour knoweth no [man]. How foolish then to be figuring out the time of the Lord's coming. No one knows the time nor the hour! To those who are not believers is it not better to believe than not,than later find out after you are left behind wondering where have we gone to? I beg you, my friend pick up The Holy Bible and begin to read, then make your decision. Simple as that! Seek out your own salvation...no one can do it for you! Psalms.25 14 The secret of the LORD is with them that fear him and he will shew them his covenant. 1Thes.5 1 But of the times and the seasons, brethren, ye have no need that I write unto you. 2 For yourselves know perfectly that the day of the Lord so cometh as a thief in the night. 3 For when they shall say, Peace and safety then sudden destruction cometh upon them, as travail upon a woman with child and they shall not escape. 4 But ye, brethren, are not in darkness, that that day should overtake you as a thief. 5 Ye are all the children of light, and the children of the day we are not of the night, nor of darkness. 6 Therefore let us not sleep, as do others but let us watch and be sober. Could this also bear witness to mans life on earth? I understand accidents happen, yet could this Scripture also be referenced to a persons untimely death? Amos gives us further light on this for us in 3 5 Surely God will revele nothing but through His servants the prophets.